SPRING DRESSES PICKS - Cherry Colors - Cosmetics Heaven! Spring is around the corner and with the time to wear dresses. Here at CherryColors, we love dresses so we are excited to show you our favorites from Zaful. Come and join us in the exploration of our Dresses Picks for this Spring. 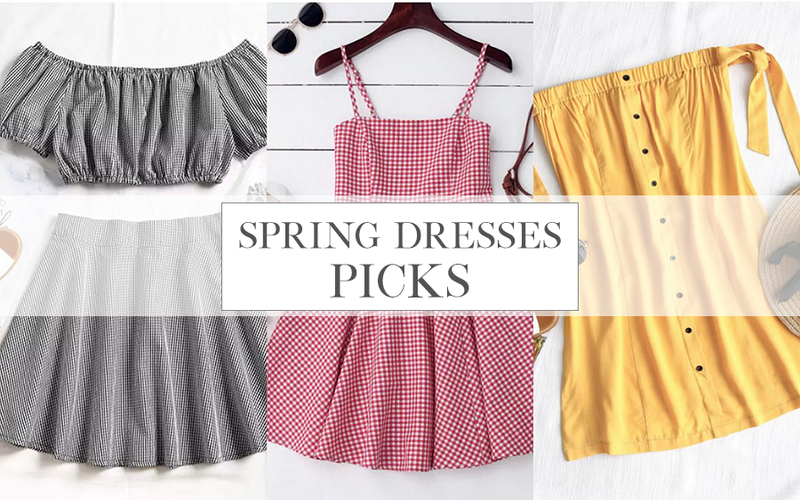 There are several dresses styles that you can find all over the internet but we decided to focus on four - Print patterns, Plaid, Mustard colored dresses and those with Lemon print. We enjoyed browsing through several printed designs and these are our favorites. Can you all say that we love flowers? If you're rather a fan of animal print dresses, you can find plenty of them too. We love the black one with flower patterns because it looks so trendy and fresh. Plaid brings me back to my childhood as this is a pattern that was popular back in the 90's. But alas, the trend is back and we embrace it with our open arms as it reminds us of innocence. Because of that, I love the red plaid dress. You can find more of them here. Let us know which is your favorite! Because of that, the sunflower dress is my favorite but the mustard yellow dress is the most trendy of them all. Just add some accessories and you're good to go. And as the last category, there's a fresh print for the upcoming warm days. It's a lemon print which makes every single dress look Instagram ready. Perfect for photos or for an outing with friends. You can find more of the lemon print dresses here. I love the second one, don't you like it too? Let me know what you think about the dresses in the comments below.